Tune in to the Musician's Show, tonight from 6:00-8:30 PM EST for a a live set and interview with Luke Sellick. 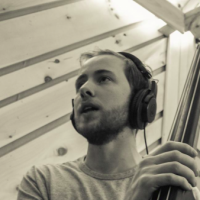 Sellick is a virtuoso bass player who lives and works regularly in New York City. Born and raised in Winnipeg, Canada, he studied music at the University of Winnipeg as an undergraduate and went on to learn under the tutelage of the legendary Ron Carter. He has found considerable work with luminaries like Johnny O’Neal, Russell Malone and Kenny Barron recording a number of albums as a side man. His own recent debut album as a leader, The Alchemist, was released this past March.